This past weekend I attended the BlogHer conference in San Jose representing Austin Moms Blog as a brand ambassador for a brand spankin' new and amazing app called One Day (I'll post more about them tomorrow). I had a wonderful time promoting the One Day app, as well as soaking in everything that is BlogHer. Before last weekend, I had only attended style blogger conferences, which evidently are a completely different breed because several things caught me off-guard while at this diverse conference...let me know if any of you can relate. 1. Everyone A LOT of attendees were dressed SO casual. Again, having only attended style blogger conferences where attendees are dressed to the nines, this was a total shocker to me. I'm not saying they didn't care what they looked like, but....(I'm sorry that sounds judgy). I know for one thing for sure, they were a lot more comfortable than I was, which is something I had researched beforehand...dress for comfort. Clearly, I didn't take the advice. 2. The Voices of the Year was the main attraction for most attendees. I didn't attend the VOTY ceremony, however, I asked many repeat BlogHer attendees what their favorite part of the conference was...they ALL responded with how inspirational and uplifting the VOTY's are and that it was the best part of BlogHer. (You can read them all HERE.) Not the sessions, not the keynotes, but the blog posts of the year that were so moving, poignant, and made a difference in people's lives. Note taken...next time, don't miss it. 3. Arianna Huffington is a little spit fire. This woman (yeah, that woman---Huffington Post)...I didn't know much about her before I heard her interview (by Guy Kawasaki), but I was very interested and impressed by what she had to say. He asked various questions about her new book and about her amazing career in general, and do you know what the running theme of ALL of her answers was? SLEEP. How cool (and so true) is that?!? Coming from such a successful and inspirational women talking to a room full of mom bloggers hanging on her every word....sleep was the message. I loved it. Oh, and she speaks in quotable 140 characters, to be sure. 4. Bloggers are Bloggers are Bloggers. Being my first exposure to a diversity of bloggers, I wasn't sure what I would encounter. In the expo at the One Day booth, I wondered if we'd meet bloggers who were all about the brand collabs, or bloggers who just were looking for free stuff, or bloggers who just wanted to talk and share their story or bloggers who were exuberant to have some "alone time" away from kids. And what I found was that none could be pegged. Yes, there were some that fit into each of those categories, but mainly what I realized (and curiously enough, I realized this from a vendor standpoint), was that they're generally all the same. Just like me. And having a general knowledge of how all these other bloggers thought and were motivated, it brought a new dimension to performing my job as a One Day ambassador...a sense of community and relatability. (I hope that makes sense.) Basically, we're all in this crazy thing called blogging together...we GET each other. 5. Feminist undertones heard throughout many of the breakout sessions. Bloggers are influencers, so asking them to sit on a panel and discuss the "future of blogging" or "the social aspect of their brand" will inevitably steer towards personal experiences...most of which I'm sure had already been documented in their respective blogs. I guess this one isn't too surprising, but I was slightly amused at how much "girl power" seemed to drive several of the sessions and conversations. Duh Kristen, BlogHER. I had a wonderful time and would love to attend again next year! A huge thanks to One Day for bringing me along with them for this incredible experience! 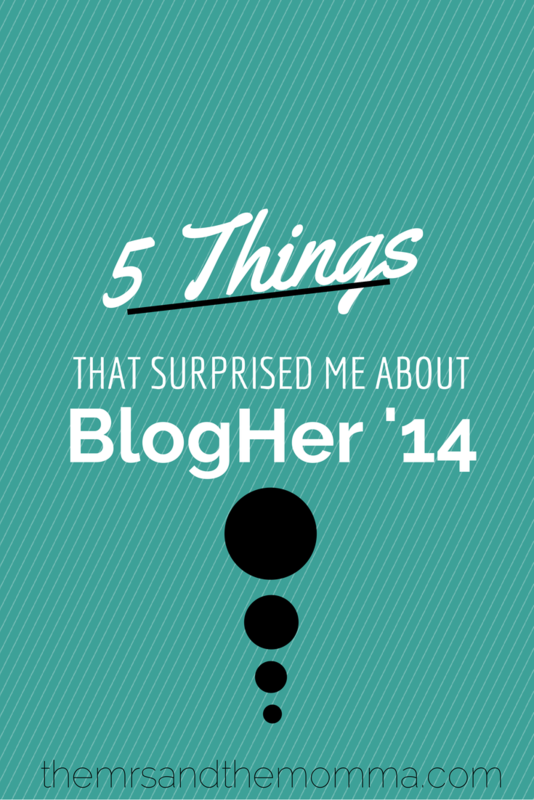 -Have you ever attended a BlogHer conference or were you there this past weekend? -If so, where you "surprised" by anything you experienced there?